Representatives from Audubon Pennsylvania and the Wyncote Audubon Society present the Cheltenham Township Board of Commissioners with signs that recognize the community as an Audubon Bird Town. The board adopted a resolution to become at Bird Town at the recommendation of the Cheltenham Environmental Advisory Council (EAC). A perfect complement to the Cheltenham Sustainability Plan, becoming a Bird Town will both highlight the township’s ecological resources and extend environmental outreach and education. 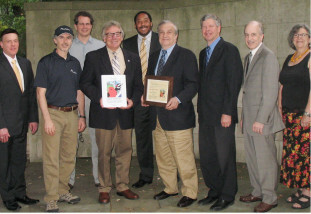 Pictured at right: Leigh Altadonna (fourth from left), president of the Wyncote Audubon Society, and Steven Saffier, (second from left) Audubon Pennsylvania At Home Coordinator, joined Township Manager Bryan T. Havir (left), EAC Chair Kurt Ahrens (third from left), and Commissioners (left to right) Baron B. Holland, Morton J. Simon, Jr., Daniel B. Norris, Brad M. Pransky and Ann L. Rappoport at a recent commissioners meeting at Curtis Hall in Wyncote. At the July 20, 2016 Meeting of the Township of Cheltenham Board of Commissioners, representatives from Audubon Pennsylvania and the Wyncote Audubon Society presented the official street signs to recognize Cheltenham Township as an Audubon Bird Town. This recognition by Cheltenham Board of Commissioners follows their action in April 2016 where the Board adopted a resolution to be recognized as a Bird Town. The Cheltenham Township Environmental Advisory Committee recommended this action to the Commissioners after working with Audubon over the course of the past year. Cheltenham joins over 20 other municipalities in Pennsylvania that have joined the Audubon Bird Town program. Several Audubon Bird Town signs will be installed on the major roadways that enter the Township. This program is a partnership with Audubon Pennsylvania, the state office of the National Audubon Society and the Wyncote Audubon Society, the local chapter of the National Audubon Society. The program recognizes townships for their commitment to stewardship. The Audubon Bird Town initiative dovetails with the excellent work of the Cheltenham Environmental Advisory Council and the “Sustainable Cheltenham” program. Audubon will continue to work through the Environmental Advisory Council to highlight the township’s incredible ecological resources and provide outreach and education to property owners. Community events and workshops will be offered. Many Audubon Bird Town activities have already been established. Wyncote Audubon helped to sponsor the Tookany/Tacony Frankford Watershed’s “Creekside Bird Garden Tour” this past June to provide participants with visits to homes that have planted native plants that attract birds and butterflies and function as a riparian buffer to contribute to the improvement of water quality and slow storm water runoff. Wyncote Audubon also worked with third and fourth grade students at Cheltenham Elementary School. Teachers and students at Cheltenham Elementary School formed an “Audubon Bird Club” and learned about winter birds, participated in the “Great Backyard Bird Count, and learned about spring migration. Activities included bird walks on the school property and ways to enhance areas of the school property as bird habitat. A goal is to continue to expand this work with students in the public, private and parochial schools in Cheltenham. Other Audubon Bird Town goals will be to work with the Cheltenham Parks and Recreation Department and citizens to improve the habitat in passive recreation areas such as the Pearly and Parry Bird Sanctuaries. 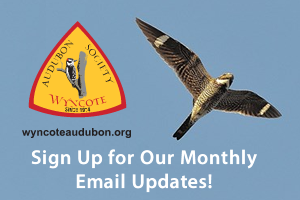 Efforts to expand monitoring of the birds in these and other locations is an initiative of the Wyncote Audubon Society with the goal of having sections of the Tookany Watershed designated and recognized as part of the Audubon Important Bird Area. The Important Bird Area Program is part of an international program that seeks to identify areas of significant protection to birds.